The work of Zecharia Sitchin' is an infamous name in Ufology and Ancient Alien theory circles. His narrative has been echoed by countless other researchers. But what if Sitchin was wrong in his translations of the Sumerian Cuneiform tablets? Michael S. Heiser is a Ph.D whose studied ancient Semitic languages at the University of Wisconsin. Since 2001, Heiser has contended that Sitchin's claims, for the most part, have no supportive references in the actual tablets. According to official scholarly research, codified in the Chicago Assyrian Dictionary (CAD), an over 20 volume long catalog of all known Acadian words, and their Sumerian counterparts in the archeological record, there is no reference to Nibiru being the 12th planet. This assembly of references is a 90-year joint effort of scholars in the field of linguistics. If a word or term is mentioned anywhere in the tablets, it will ostensibly be listed somewhere in the CAD for easy reference. 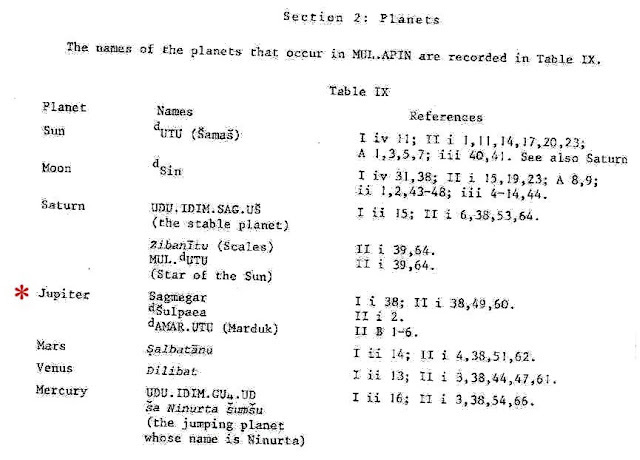 So the question is: if Sitchin's assertions are accurate, that Nibiru refers to a 12th planet beyond Pluto, then we should easily find it in the CAD, provided it is complete. And with this premise in mind, Heiser set out to verify Sitchin's claims. 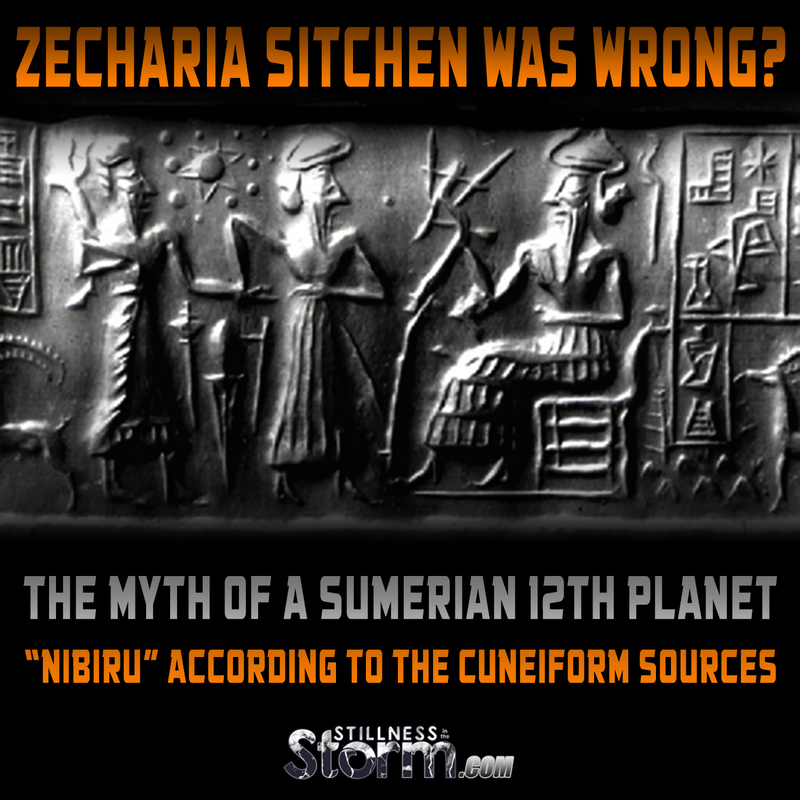 Instead of finding many references to Nibiru being the infamous 12th planet, or Planet X, there was no confirmation of Sitchin's claims. Nibiru was actually listed in the CAD referring to "some sort of “crossing marker” or “crossing point”". Heiser concludes, on this point of Nibiru, and several other investigations, that the whole of Sitchin's work is an elaborate fabrication with no scholarly evidence to support his claims. I myself have no concrete conclusions to draw in this respect. To be clear, I have reviewed Sitchin's material in the past, and while it did sound compelling, I can hardly claim it is absolute truth, especially since I never attempted a translation of the tablets myself. If like me, you are a layman trying to make sense of all this, I suggest getting ready for a boots on the ground review of the evidence provided by Heiser. I make no claims as to it being true or false, it's merely data for your consideration. And please, before dismissing the material as 'dis-info' take the time to review it. In the interest of objectivity, in order to discern which account is true, we must verify the data ourselves, to the best of our ability. In many of Sitchin's presentations, he asserts that the tablets say one thing or another, but rarely, if ever provides supportive evidence for his interpretations. Heiser, on the other hand, at least provides the CAD references for where each term is listed in the Cuneiform catalog of tablets. However, the translations used are not explained beyond the fact that the CAD itself, which is an over 90-year research project, states that a term means one thing or another. So at the end of the day, we still have to accept the conclusions of the CAD scholars to consider what is offered by Heiser as true. To be honest, I can't claim to know with absolute certainty if Heiser is any more right then Sitchen, but at the very least, we have more raw data to discern for ourselves in Heiser's work. And it is personal discernment, the exercise of our truth receptivity agency, that I am interested in. My goal is to help myself and others become better truth seekers in our own right so that we no longer need to rest our conclusions on others, be they official experts or a close friend. As a side note: I found this article in preparation for the weekly summary and analysis of Cosmic Disclosure, with Corey Goode and David Wilcock. This week, in Episode 6, Season 3, Inner Earth: The Library, Goode describes more of his alleged trip to Inner Earth, where he met with an extremely old race of ancient humans. According to the priestess that was playing host to him, Kaaree, Zecharia Sitchen's narrative is "contrived" or made up. Goode made reference to the website sitchiniswrong.com, which led me to the following article and paper on Nibiru. My personal opinion of the claim that Sitchin's narrative is wrong is even less conclusive. But I will say that if Sitchin was wrong, then possibly all the past years of people claiming Planet X and Nibiru are going to contribute to a world-ending event, could all be part of an elaborate psyop or co intel pro initiative. Duping real people into promoting a false narrative. In a grander sense, I always strive to keep an open mind about everything, never asserting that my conclusions are absolutely certain, for to do so would require absolute knowledge. But since my knowledge is always expanding with experience, and this is also true for humanity at large, then it stands to reason our understanding will transform with time. As we learn more about the truth, what we thought was true in the past ceases to be as true in the face of new evidence. If Goode's claims are accurate, then it lends further credence to Heiser's assertions and vice versa. I do my best to review the evidence available, shaping my conclusions around the data at hand, always seeking to support an idea with evidence and logic, be it material or conceptual. And in instances where I want to believe an idea, yet lack evidence to confirm it, I do my best to keep an open mind in this case as well, even if it goes against what I want to be true. If Sitchin's work is, in fact, a grand deception, we would do well not to dismiss everything he discusses as a lie, which so many can be tempted to do in situations like this. If we consider that even the most elaborate deception is woven with threads of truth, then any lie has elements within it that are of value to the truth seeker. 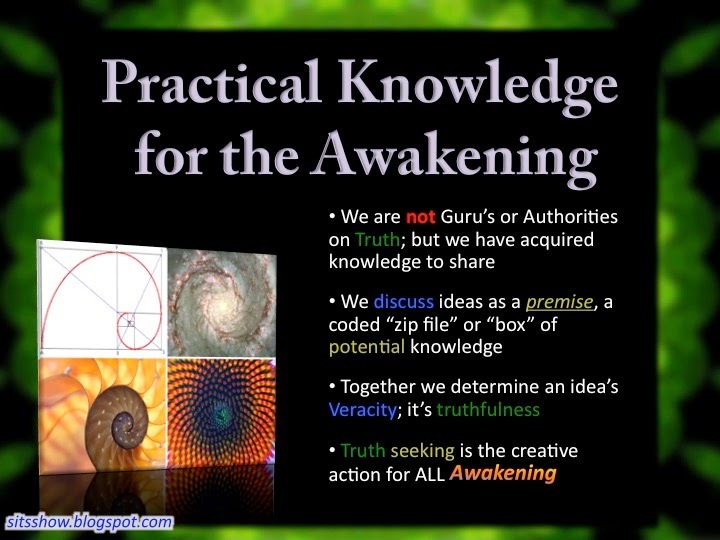 Entertaining an idea, holding it within the cup of our mind, without having to accept it as true is an invaluable skill in the age of deception we find ourselves in. It is my hope in presenting this material that my fellow truth seekers are given an opportunity to practice their discernment. I have included the introduction to this topic from Heiser's website, as well as a web friendly version of the pdf in full. The pdf file itself can be downloaded here, which is also embedded in the following article. In the future, I will most likely be posting other papers from Heiser. Welcome to the website devoted to addressing the claims of the ancient astronaut hypothesis popularized in the writings of Zecharia Sitchin. Who's behind this site? My name is Mike Heiser. Who am I? The short answer is that I'm a scholar of biblical and ancient Near Eastern languages, cultures, and religions. Why do I bother with this stuff? Because I don't like ancient texts manipulated to promote false claims. If I were a lawyer I'd feel professionally obligated to tell you if someone was giving you bad legal advice. If I was a medical doctor, I'd owe you the truth if I knew the medicine you were taking was bogus or could kill you. If I was an accountant, I'd let you know if a neighbor's tax advice could put you in jail. I'm none of those things, but take the analogy to heart. I'm trying to provide the same service in my areas of expertise. I can tell you--and show you--that what Zecharia Sitchin has written about Nibiru, the Anunnaki, the book of Genesis, the Nephilim, and a host of other things has absolutely no basis in the real data of the ancient world. I don't doubt that Zecharia Sitchin is a nice guy; he's just wrong. Nothing personal. SITCHINISWRONG.COM has been online since 2001. Shortly after I wrote my novel, The Facade (during what should have been my first year of writing my PhD dissertation), I was invited to be a guest on Coast to Coast AM. Former host Art Bell asked me if I would debate Zecharia Sitchin live on the show and I accepted. Sitchin has never returned the favor. I was quickly attacked, though, by other "researchers" who accused me of making piles of money off Sitchin's name. I answered by posting my income tax returns on the Internet. My accusers crawled back under their rocks and I went on to finish my dissertation in Hebrew and ancient Semitic languages (University of Wisconsin-Madison, 2004). I never really returned to normal life completely, though. I've been on a number of radio shows, made frequent re-appearances on Coast to Coast AM, and spoken at conferences that focus on this sort of thing. The people I meet and the hosts that interview me have proven to be bright, inquisitive, likeable, and sincere. I just try to get them to look at the data. Those familiar with either the writings of Zecharia Sitchin or the current internet rantings about “the return of Planet X” are likely familiar with the word “nibiru”. According to self-proclaimed ancient languages scholar Zecharia Sitchin, the Sumerians knew of an extra planet beyond Pluto. This extra planet was called Nibiru. Sitchin goes on to claim that Nibiru passes through our solar system every 3600 years. Some believers in Sitchin’s theory also refer to Nibiru as “Planet X”, the name given to a planet that is allegedly located within our solar system but beyond Pluto. Adherents to the “returning Planet X hypothesis” believe the return of this wandering planet will bring cataclysmic consequences to earth. Is Sitchin correct – Is Nibiru a 12th planet that passes through our solar system every 3600 years? Did the Sumerians know this? Unfortunately for Sitchin and his followers, the answer to each of these questions is no. But how do I know? The cuneiform record in such texts as the one on the left, the astronomical text known as MUL.APIN (The "Plough Star"). Here is a video that I created showing you where to find the leading dictionary of cuneiform words online (for free). Viewers can find that source and do what I do in the rest of the video: look up the entry for nibiru (spelled neberu in scholarly transliteration) and check to see if any of the above ideas are found in any Akkadian or Sumerian texts that mention nibiru. Spoiler: there aren't any -- but don't take my word for it. Look it up yourself. 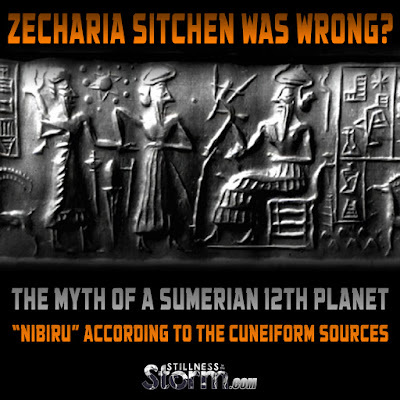 Is Sitchin correct – Is Nibiru a 12th planet that passes through our solar system every 3600 years? Did the Sumerians know this? (2) Are those who equate Sitchin’s Nibiru with Planet X correct in this view? Unfortunately for Sitchin and his followers, the answer to each of these questions is no. How often and where does the word “nibiru” occur in cuneiform texts? What does the word mean, and is there an astronomical context for the word in any of its occurrences? What are the cuneiform astronomical sources for our knowledge of ancient Mesopotamian astronomy? What do those sources tell us about Nibiru? (1) It is important to note that Sitchin himself does not claim that Nibiru is Planet X or that Nibiru is returning this spring (May 2003). (2) For readers who are familiar with Sitchin’s use of cylinder seal VA 243 as a defense for Sumerian knowledge of 12 planets, see the webpage on my website devoted to this error and the accompanying PDF file. (3) The article is B. Landsberger and J.V. Kinnier Wilson, “The Fifth Tablet of Enuma Elish,” Journal of Near Eastern Studies 20 (1961): 172ff. This is the scholarly journal of Near Eastern studies produced by the University of Chicago’s Oriental Institute. The Sumero-Akkadian lexical lists (cuneiform bilingual dictionaries) are referenced on my website in the discussion of Sitchin’s idea that words like shamu refer to rocket ships. The Mesopotamian scribes tell us what these words mean in their own dictionaries (and Landsberger was the scholar who compiled these lists in a multi-volume work [in German]). directly with the subject, and a recent German article (1990) does likewise. (4) All of these articles were written well after the cuneiform documents / tablets that mention Nibiru as an astronomical body were known, and hence the authors had access to all the pertinent texts. Other works dealt with Nibiru (see below for sources and footnotes), but only in passing, as their focus was Babylonian astronomy in general. What you are reading in this present paper is an attempt to synthesize this material and account for all references to Nibiru in cuneiform tablets with an attempt to discern what exactly Nibiru is. Section Two: How often and where does the word “nibiru” occur in cuneiform texts? What does the word mean, and is there an astronomical context for the word in any of its occurrences? 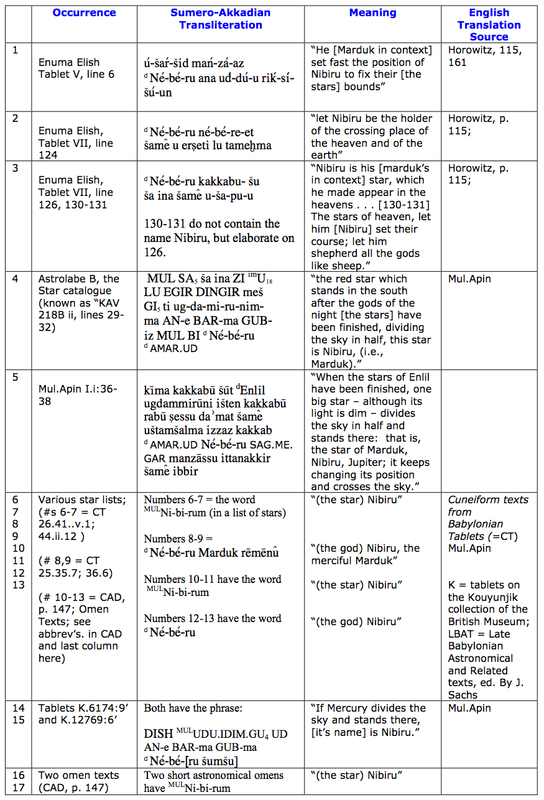 Fortunately for scholars and other interested parties, the work of the studies above and the editors of the monumental Chicago Assyrian Dictionary (= CAD hereafter) have located and compiled all the places where the word “nibiru” and related forms of that word occur in extant tablets. A look at the CAD entry (volume “N-2”, pp. 145-147) tells us immediately that the word has a variety of meanings, all related to the idea of “crossing” or being some sort of “crossing marker” or “crossing point”. In only a minority of cases (those references in astronomical texts) does the word relate to an astronomical body. Below is a brief overview of the word’s meanings outside our immediate interest, followed by specific meanings and references in the astronomical texts. “place of crossing” or “crossing fee” – In the Gilgamesh epic, (6) for example, we read the line (remarkably similar to one of the beatitudes in the sermon on the Mount): “Straight is the crossing point (nibiru; a gateway), and narrow is the way that leads to it.” A geographical name in one Sumero-Akkadian text, a village, is named “Ne-bar-ti- Ash-shur” (“Crossing Point of Asshur”). Another text dealing with the fees for a boatman who ferries people across the water notes that the passenger paid “shiqil kaspum sha ne- bi-ri-tim” (“silver for the crossing fees”). “ferry, ford”; “ferry boat”; “(act of) ferrying” – For example, one Akkadian text refers to a military enemy, the Arameans: “A-ra-mu nakirma bab ni-bi-ri sha GN itsbat” (7) (“The Arameans were defiant and took up a position at the entrance to the ford [gate, crossing point]”). In another, the Elamites are said to “ina ID Abani ni-bi-ru u-cha-du-u” (“[to] have cut off the ford [bridge, crossing way] of the river Abani”). (4) A. Schott, “Marduk und sein Stern” (“Marduk and his Stars”), Zeitschrift fur Assyriologie 43 (1936): 124-145; Johannes Koch, “Der Mardukstern Neberu” (“Marduk’s star Nibiru”), Welt und Orients 22 (1990): 48-72. (5) For the most part in this paper I have not used the standard scholarly transliteration font with diacritical marks. I have instead tried to spell Akkadian words phonetically for readers. An exception would be the chart of Nibiru references below. (7) The “GN” refers to a determinative for a geographic name. (8) Sitchin of course notes the basic “crossing” meaning in his book. One just needs a dictionary for this, as the above indicates. He then supplies – without textual support – the idea that Nibiru is a planet that “crossed” paths with other planets in our solar system on its regular 3600 year course. The rest of this paper will demonstrate the flaws in this view. subscripted numbers = the numerical reference number for Sumerian signs that can stand for more than one syllable. This is a scholarly convention for keeping such overlapping signs distinct so the texts can be read accurately. At the risk of some redundancy, you will notice quickly that Nibiru is preceded by both “d” and “MUL”, and so is referred to as a deity and a star. As Sitchin himself notes on various occasions (and this is common knowledge to ancient near eastern scholars), ancient people often identified the stars or planets as gods, as though the stars were deified beings. This is one reason why even in the Old Testament the sons of God are referred to as stars (cf. Job 38:7-8). In the texts that follow, Nibiru was regarded as a planet (specifically, Jupiter, but once as Mercury), a god (specifically, Marduk), and a star (distinguished from Jupiter). (9) “Transliteration” refers to putting the characters of a foreign language into “English letters and sounds” so as to enable us to verbalize the text. Translation, on the other hand, is taking that text and putting its meaning into the appropriate words of another language. At times in printed works dealing with the texts in question the editing / layout differs (e.g., capitalizing or superscripting). As noted previously, Nibiru was regarded as a planet (specifically, Jupiter, but once as Mercury), a god (specifically, Marduk), and a star (distinguished from Jupiter). In the next section, Section Three, I’ll provide some information as to what the most important sources for cuneiform astronomy are. Specifically, any of the above references that add commentary about Nibiru (as opposed to just listing the name) will be discussed. With that background we’ll head to Section Four and discuss the specific lines in context that talk about Nibiru. Section Three: What are the cuneiform astronomical sources for our knowledge of ancient Mesopotamian astronomy? (1) The cylinder seal VA 243, which is dismantled in another PDF file on my website. (12) In a nutshell, the “sun” on the seal (which allegedly depicts the solar system) is not the sun – based on the consistent style of the actual sun symbol in Sumero- Mesopotamian seals and art. Without a sun, you don’t have a solar system. (2) The claim that Nibiru lies beyond Pluto and is home to the Anunnaki, neither of which come from the actual texts (see the chart above (13)). (10) Francesca Rochberg, “Astronomy and Calendars in Ancient Mesopotamia,” Civilizations of the Ancient Near East, vol. III, ed. Jack Sasson (2000): p. 1925. This is likely the best introduction lay to the subject, and so I use it here throughout. (11) The reader must realize that dating ancient tablets is not arbitrary. Dates are determined by several methods: (1) The names of kings or other important figures in texts (like generals or priest) who are cross-referenced in other sources, often from other countries (like Egypt). In the case of kings, these names are then matched to king lists or other lists that tell us the number of years in succession each king reigned. One can therefore start plotting out a chronology in conjunction with the records of other ancient peoples. “Starting points” or benchmarks are obtained by Greek or Roman records (which take us well into the “AD” and several centuries backinto “BC). (2) Astronomical events mentioned in texts (like eclipses) that can be plotted today via modern astronomical techniques and records. Often these events also show up in other ancient sources as well. (3) Important events that show up in texts (like battles or treaties) that reference other nations or are themselves recorded in other sources (common for both parties in treaties to record them). Again, these can be cross-referenced. (4) Once a body of cuneiform tablets accumulates that can be chronologically dated, scholars make note of changes in vocabulary, style, and grammar. This enable them to date tablets that do not have any of the chronological markers in them noted above. To illustrate, if you found a letter in your attic or a yard sale that had words like “thee” or “thou” in it, you’d know immediately that the letter could be an approximate number of years old. Once you checked with experts, you could get it quite close (at least to the decade). If you found a letter that LOOKED old, but had the word “email” in it, you’d also know it couldn’t be older than the year when email came into being. (13) If one wants to disagree with the chart, I invite the reader to simply look up the references to Nibiru in the Chicago Assyrian Dictionary and then go look up the English translations in the sources in the charts, as well as the bibliography at the end of this paper. The oldest cuneiform astronomical texts deal with omens (called by scholars, “celestial divination texts”). The detailed nature of omen texts (ca. 1800 BC), however, does raise a caveat in the dating. While our oldest texts go back to 1800 BC, it is apparent that celestial divination (and hence astronomical observation) did not come into existence at that time – it’s already systematized. This argues for an older date, but precision is based only on speculation. In regard to an older astronomy than 1800 BC, the reader should be advised that all I am saying (with scholars of this field) is that the practice of observing the heavens is older than 1800 – not that the Sumerians could have known how many planets there were. We have, in fact (see below) full-blown astronomical tablets with SUMERIAN star names (Sumer as a civilization pre-dates 1800 BC), yet it is these very tablets that inform us that the Sumerians only knew of five planets (plus sun and moon). They are not incomplete either, as though they forgot a few or left them off the tablet. 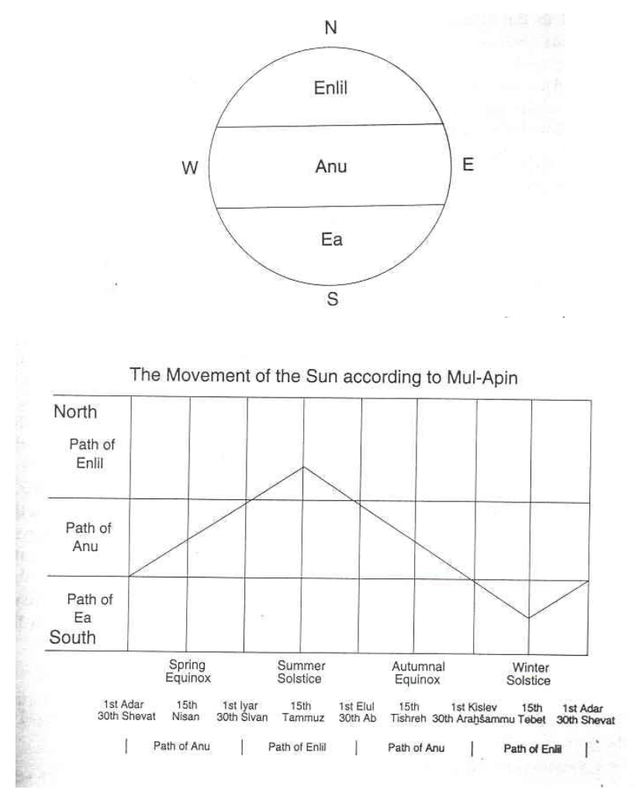 MUL.APIN is a complete astronomical cycle of observations – it’s a compendium of Sumero-Mesopotamian astronomy. But on to specific sources now! 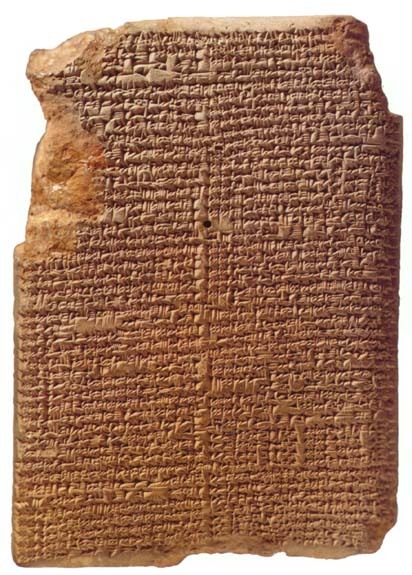 As experts in Sumero-Mesopotamian astronomy note, three texts “characterize the interest of Babylonian astronomy before 500 BC, as well as the level of penetration into astronomical phenomena attained in this period.” (16) These three texts are: Enuma Anu Enlil (which is not the same as Enuma Elish), the “Three Stars Each” tablets (better known as “Astrolabes”), and MUL.APIN. The first of these has little bearing on the Nibiru matter. When we discuss Nibiru momentarily, we shall also need to look at Enuma Elish Tablet V which, though not an astronomical text, does mention Nibiru. This tablet mathematically calculates “the duration of lunar visibility throughout a thirty day equinoctial month.”(17) Since the length of night changes from month to month, the Babylonians also devised a method of mathematically calculating lunar visibility for any day of the year. (14) See the chart from MUL.APIN below. (15) Again, you either get your facts from the Sumero-Akkadian texts and scribes or Sitchin. The choice seems obvious enough to me. (16) The quotation is from Rochberg, p. 1927, but see also the bibliography at the end of the paper. (21) The three illustrations are from W. Horowitz, Mesopotamian Cosmic Geography (Eisenbrauns, 1998): 156, 165, 173. One observation is appropriate before moving on. 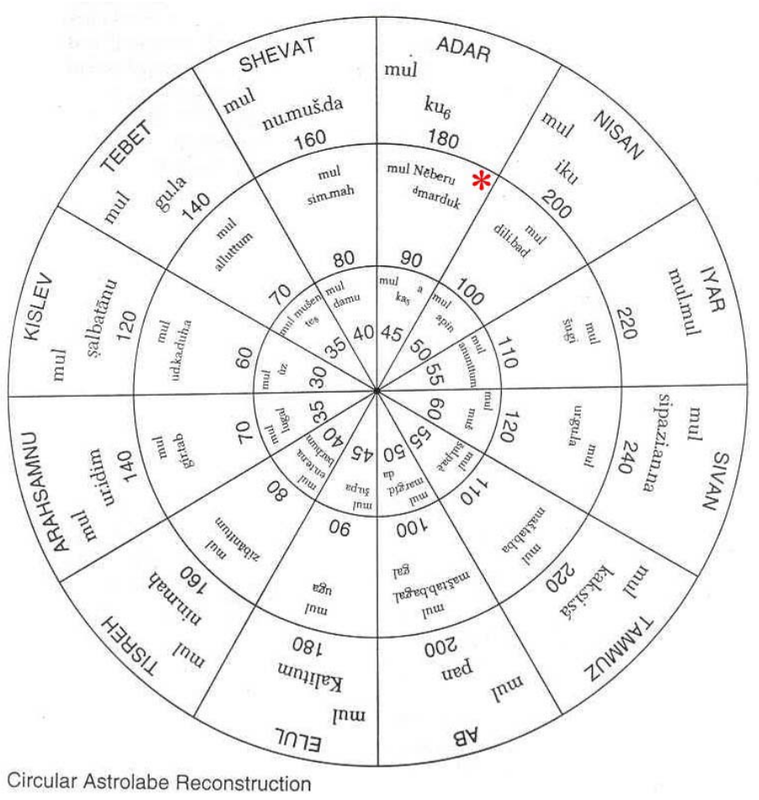 The fact that these stars in the astrolabe are all “fixed” may suggest that since Nibiru is described as Marduk-Jupiter and also Mercury in one text, and yet “changes course” (see # 5 reference in the chart above), this shows that the fixed star of Nibiru may have changed position, depending on when its observation in the various texts was made. (22) Rochberg, p. 1930. Unless otherwise noted, this section is a summation of Rochberg, p. 1930.
four of which overlap with the thirty six stars of the astrolabe (including Nibiru). Tablet two continues with the path of the sun, moon, and planets. Appearances and disappearances of Venus, Jupiter, Mars, Saturn, and Mercury are provided, along with discussion of winds, the solar year, length of daylight at cardinal points of the year, and duration of the moon’s setting. Section Four: What do these sources tell us about Nibiru? In concert with the chart of references to Nibiru, we’ll focus the rest of the discussion on those texts and passages that do more than just list Nibiru among stars. 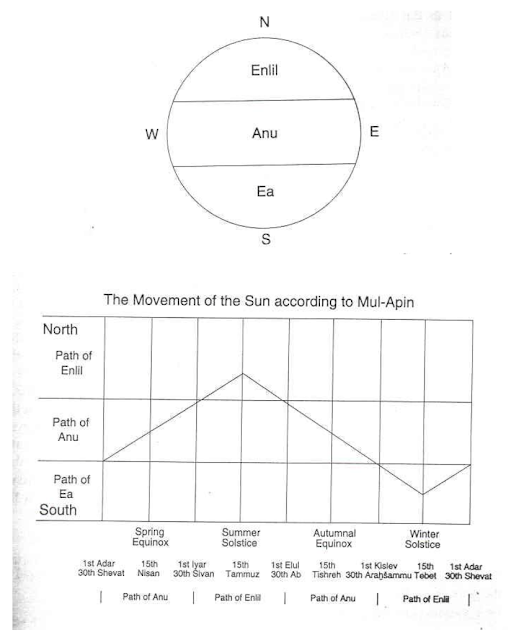 The major references to Nibiru are Enuma Elish (mentioned only in the chart thus far), the Astrolabe, and MUL.APIN. Nibiru: let him/it [Nibiru] be the holder of the crossing of heavens and earth. (line 125 follows: “. . . so that they [the heavens] cannot cross above and below, but must wait for him [Nibiru]”). Observation: Here we have a specific Sumero-Akkadian text that says Nibiru is the name of Marduk. Below we’ll see that Marduk was the name of the planet Jupiter. Nibiru can’t be a planet beyond Pluto if it’s Jupiter. Nibiru-Marduk-Jupiter has something to do with a crossing place – that is, this astronomical body itself isn’t DOING the crossing, but marks or is positioned at a crossing point. This is another point of contradiction with Sitchin’s teachings, as he argues it is Nibiru that is mobile and “crosses” into the orbital paths of our solar system’s planets. The texts do not say this. Nibiru is his [Marduk’s] star, which he made appear in the heavens. He [Nibiru] is the one who holds the “turning point” [the crossing point, juncture]; they must look to him. The stars of heaven, let him [Nibiru] set their course; let him shepherd all the gods like sheep. (23) Mesopotamian Cosmic Geography, pp. 114-115.
apparent plurality being only a renaming of the same thing) or some star inextricably connected to Jupiter, it regulates the stars keeping them in their courses. 1) He [Marduk] fashioned the stations for the great gods. 2) Their stars, their likeness he set up, the constellations. 3) He fixed the year, drew the boundary lines. 5) After he drew up the designs of the year. 6) He set fast the station of Neberu to fix their bands. 7) So that none would transgress or be neglectful at all. 8) He set the station of Enlil and Ea with it. 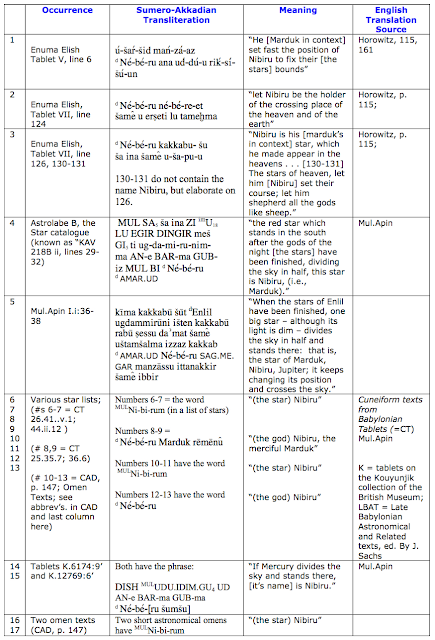 Observation: This “station” is explained by scholars by referring to the above lines (124-127) in Tablet VII. Nibiru’s “stationing” is taken to be the “special role” assigned by Marduk: some sort of regulating point or influence over the stars that seems to dictate the courses of the stars. The red star which stands in the south after the gods of the night [the stars] have been finished, dividing the sky in half, this star is Nibiru-Marduk. Observation: At the very least, as Horowitz notes, the above text in the Astrolabe indicates that Nibiru, Marduk’s star, along with those stars of Ea and Enlil were to be found in the sky as the old year passed and the new year began. The phrase “red star” is interesting, and makes one think of Mars. The Mesopotamians of course knew of Mars (its orbit is catalogued in MUL.APIN), however. My astronomical knowledge is minimal. Perhaps (and this is a guess) if Mars appears colored red and not colored red at different times there could have been some confusion. Is there a time when Mars “follows” Jupiter’s path so as to confuse an association to the ancient observer? If so, Nibiru and Mars might be correlated. When the stars of Enlil have been finished, one big star – although its light is dim – divides the sky in half and stands there: that is, the star of Marduk, Nibiru, Jupiter; it keeps changing its position and crosses the sky. Nibiru is clearly called the star of Marduk, and is Jupiter. Oddly, here Nibiru “crosses the sky” and so appears mobile – but elsewhere it was a “fixed” star. This again – despite the “mobility” cannot refer to a planet beyond Pluto for two reasons: (1) Nibiru is visible EVERY YEAR; (2) it is (again) either a star associated intimately with Jupiter or IS Jupiter. As noted earlier, two other tablets in the above chart aside from these major references refer to Nibiru as Mercury. 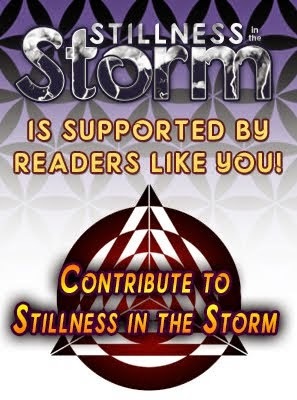 Hopefully the reader is getting a hint of two things: (1) That Sitchin’s teachings are false; (2) that there seems to be warrant for the single scholarly article I referenced in the introduction that postulated Nibiru might be the pole star which has changed position in the sky. Unfortunately, I do not know much about astronomy so I cannot evaluate this. I will, in the final section, lay out the now-rejected scholarly interpretation of Nibiru (I am not referring to Sitchin here, but actual Sumero-Mesopotamian scholars of the last century) and the pole-shift interpretation.